You won't lag behind, because you'll have the speed. You'll pass the whole gang and you'll soon take the lead. Wherever you fly, you'll be best of the best. Wherever you go, you will top all the rest. Except when you don't. Because, sometimes, you won't. Did you ever fly a kite in bed? Did you ever walk with ten cats on your head? Did you ever milk this kind of cow? Well, we can do it. We know how. If you never did, you should. These things are fun and fun is good. Don't give up! I believe in you all. Once-ler! You're making such smogulous smoke - my poor swomee swans, why they can't sing a note! No one can sing who has smog in his throat. You're too smart to go down any not-so-good-street. You're going to be roped! That we shall boil in a hot steaming kettle of Beezle-Nut Oil! Some have two feet and some have four. Some have six feet and some have more. Where do they come from? I can't say. But I bet they have come a long long way. 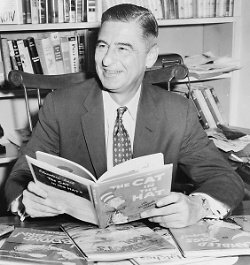 Bio: Theodor Seuss Geisel was an American writer and illustrator best known for authoring popular children's books under the pen name Dr. Seuss.